Some Wolf innovations are high-tech. Others simply reflect the practical thinking of people who make only cooking products. Bright, well-placed halogen oven lights to give you a true picture. A self-clean feature that really cleans. Racks that slide smoothly, including a bottom rack that glides all the way out, solidly supported by the oven door, for easy access to large roasts or your holiday turkey. The Wolf 914mm Dual Fuel Range features three different top configurations including standard dual-stacked surface burners. Custom rangetop configurations include the optional steel griddle or infrared charbroiler. 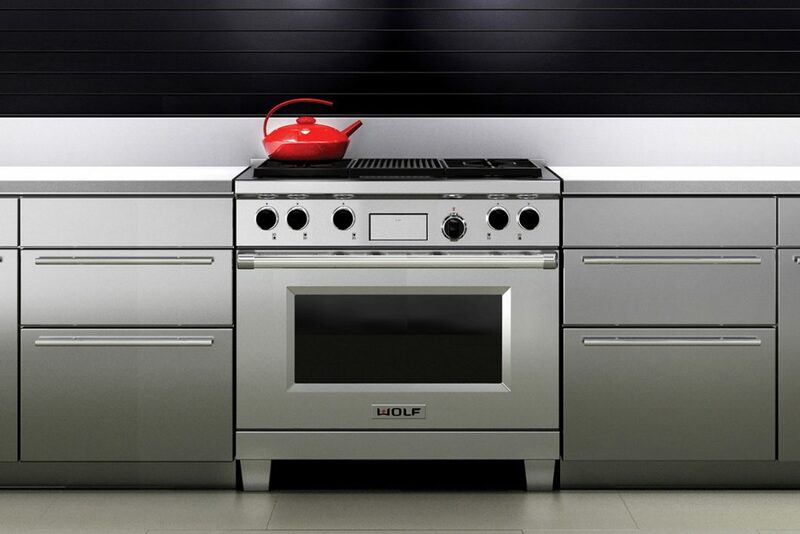 Below, a Wolf dual convection oven provides 10 cooking modes and a distinctive cobalt blue interior. Its two convection fans and four heating elements give the user convenience and superior control over ten different cooking modes. Brilliant halogen lights illuminate the beautiful blue oven interior. The Wolf ICBDF364C features a powerful 5.6kW gas charbroiler, perfect for creating succulent steaks or fish and chargrilled vegetables.